The gross domestic product of Europe’s largest economy will expand by 0.8 percent in 2019, the institutes predicted in their latest outlook published Thursday in Berlin. In September, they expected growth of 1.9 percent. Germany would be especially hard hit by an escalation of trade disputes and a disorderly Brexit as the U.S. and Britain are two of its most important trading partners, the institutes said. Uncertainty about the Chinese economy is also a risk factor. 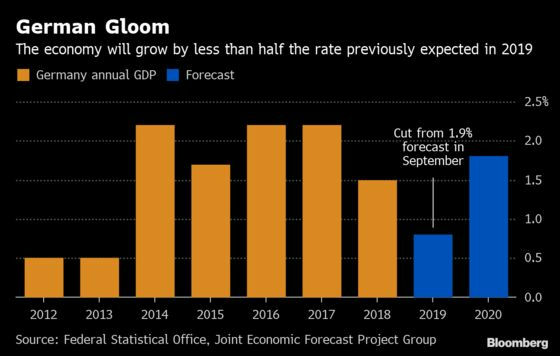 The five institutes -- IWH (Halle), DIW (Berlin), Ifo (Munich), IfW (Kiel) and RWI (Essen) -- stuck to their German growth forecast for next year of 1.8 percent. Their report forms the basis of the government’s economic outlook, due to be updated on April 17.